A source for exploring the rich heritage of Christian Art. John 20:24-31 Now Thomas (also known as Didymus), one of the Twelve, was not with the disciples when Jesus came. So the other disciples told him, “We have seen the Lord!” But he said to them, “Unless I see the nail marks in his hands and put my finger where the nails were, and put my hand into his side, I will not believe.” A week later his disciples were in the house again, and Thomas was with them. Though the doors were locked, Jesus came and stood among them and said, “Peace be with you!” Then he said to Thomas, “Put your finger here; see my hands. Reach out your hand and put it into my side. Stop doubting and believe.” Thomas said to him, “My Lord and my God!” Then Jesus told him, “Because you have seen me, you have believed; blessed are those who have not seen and yet have believed.” Jesus performed many other signs in the presence of his disciples, which are not recorded in this book. But these are written that you may believe that Jesus is the Messiah, the Son of God, and that by believing you may have life in his name. 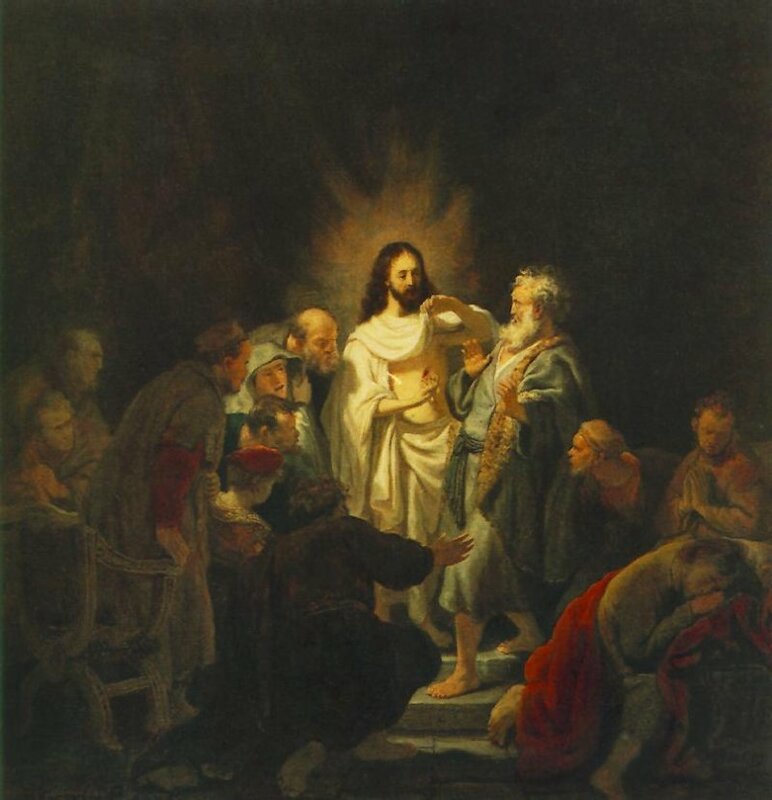 Rembrandt depicts the well-known scene somewhat theatrical. By showing his wounds, Jesus takes away Thomas's incredulity. Contrary to most other depictions, Thomas does not stick his hand into the wound. His doubts vanish when he sees the wound, just as John describes it in his gospel. John himself is depicted on the right. He appears to be sleeping, but that should be regarded as having deep inner thoughts. Rembrandt Harmenszoon van Rijn (July 1606 – October 1669) was a Dutch painter and etcher. He is generally considered one of the greatest painters and printmakers in European art history. Born in Leiden into a middle class family, Rembrandt becomes a pupil of the painter Jacob van Swanenburgh. In 1624, he studies in Amsterdam in the studio of Pieter Lastman, who will greatly influence his artistic development. Some say it is Lastman who illustrates to Rembrandt Caravaggio's use of chiaroscuro – the application of light and darkness to suggest depth.